Hover sets out with the ambitious goal of filling the gap left by Jet Set Radio. It's got the same sort of colourful but oppressive world, and the same sort of pumping techno soundtrack. It's got a similar story of youthful rebellion against an authoritarian regime, and the same sort of focus on fluid, creative movement—albeit with parkour this time, rather than roller blades. 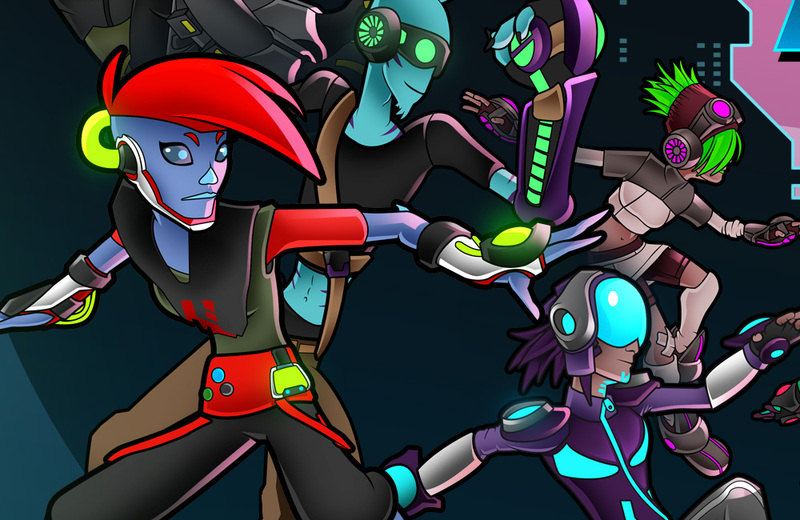 Unfortunately, as much as Hover wears its influence on its sleeve, it misses the mark by a huge margin. Wonky physics, unreliable controls, and an awful UI make the game borderline unplayable, and this game's version of anti-authoritarianism—"Gamers" rising up against "anti-leisure laws"—reads like bad fan-fiction of a certain "movement" from a few years ago. 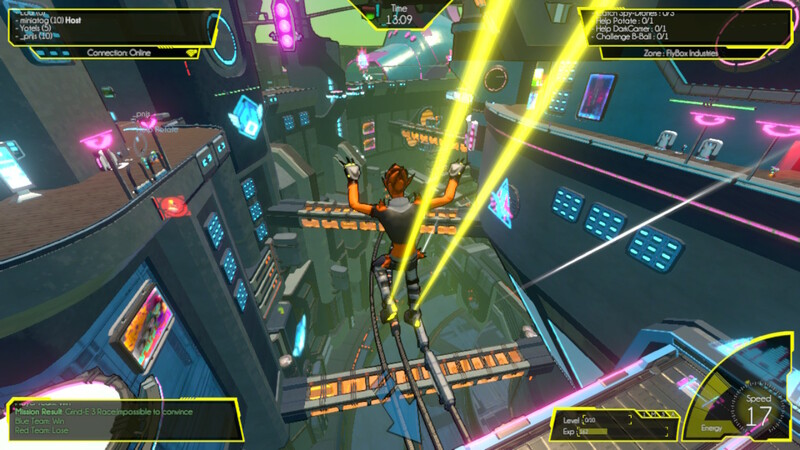 It's clear that the developers mean well and have a lot of love for Jet Set Radio, but Hover is a mess. Related reading: The World Ends With You is very different mechanically, but does a much better job of capturing Jet Set Radio's themes and tone. Read Matt's review of the Switch release. Jet Set Radio was more than just a bright, stylish freeform skating game; it was a commentary on the state of Japanese society at the time. Economic troubles and a declining population created friction between generations, as older counter-cultural youth movements took hold and the older population took issue with what they saw as a decline in respect and traditionalism. It's the same social context that gave birth to Battle Royale and, more recently, The World Ends With You. The colourful punk aesthetic, graffiti art style, and story of rising up against an oppressive corporate regime was Jet Set Radio's reaction to concerns about youth disenfranchisement. It was a game that put a focus on freedom, both of movement and of expression in contrast to a culture that seemed reluctant to give those same freedoms to its younger generation. Hover's take on that is capital-G "Gamers" rising up against a regime that's outlawed fun. It almost comes across as a satire of "gamer culture"—where people have built entire identities around liking a particular form of entertainment and take other people not liking the same thing (or liking the same thing but for different reasons) as some sort of "oppression"—but it lacks the self-awareness to make that stick. Instead, Hover just comes across as tone-deaf. At best, it's enviably unaware of the state of "gamer culture" post-2014; at worst, it reads like bad Gamergate fanfiction. Stories of the oppressed rising up against their oppressors are timeless, but they hinge on at least some degree of believability in the oppressed and oppressive groups. In 2018, "Gamers" fighting back against an "anti-leisure" regime isn't that. One could almost look past that and just enjoy freestyling around a colourful world, if only Hover didn't fall so short in this regard, too. In a game built entirely around fluidity and movement, a flawless physics system is a necessity, but in Hover, it constantly feels like you're playing underwater. Jumps are floaty and mobility while airborne is limited, making it an arduous task just to jump and land where you plan to. On the ground, even something as simple as changing direction is fiddly, with a character who always seems to turn either too much or not enough. Level design is also weirdly empty, with far fewer objects and things that you can grind on and leap off than you'd expect. 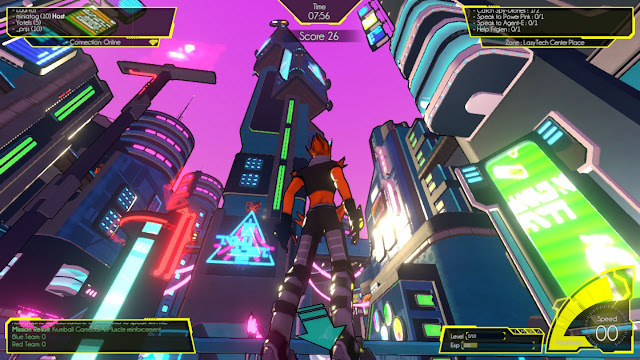 Hover has you spending far more time running around on flat ground than you'd expect from a game that's trying to be a spiritual successor to Jet Set Radio. With those objects and features that you can parkour across, you're as likely to just bounce off them or get caught on geometry than you are to actually bound over them. If you a game about freeform, fluid, creative movement to work, you need sharp controls, sharp physics, and sharp level design. Hover has none of these. It seems like that's a fact that wasn't lost on the developers, either, since they decided to include a "rewind" button that lets you rewind your movement should you make a mistake (think Prince of Persia). Unfortunately, constantly missing jumps thanks to finnicky controls, rewinding, and then doing it all again is the antithesis of freeform, fluid, creative movement. A terrible user interface only compounds Hover's more glaring issues. The menu systems are all driven by an awkward virtual mouse, and the in-game UI is both cluttered and extremely unhelpful. With three separate logs tracking various things, text on screen is plentiful, but it's tiny and difficult to read. Waypoint markers are actively unhelpful, and without any mini-map, you're left with fighting through layers of clumsy menus to find the map if you want any hope of figuring out where you're going. 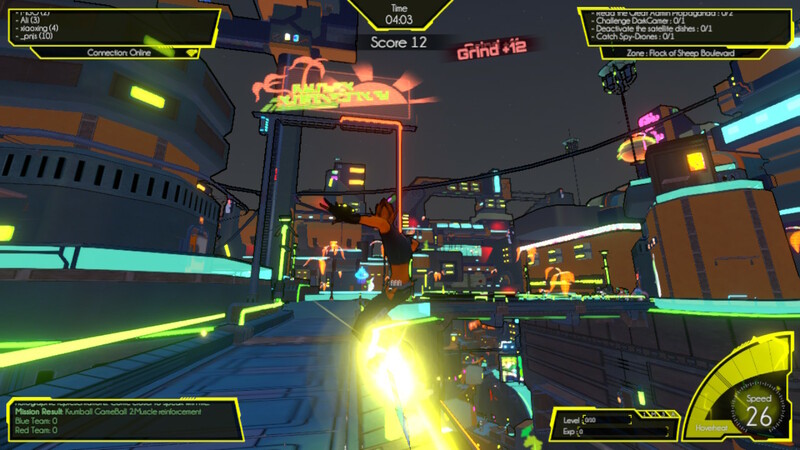 It's clear that the developers have a lot of love for Jet Set Radio, and at least superficially, Hover hits all the right notes: it's bright and colourful, with a sort of hip-hop cyberpunk aesthetic and catchy techno soundtrack. But it misses all the marks on the most crucial elements, with a game that's constantly let down by its physics and controls and a story about "Gamers" fighting back against "anti-leisure laws" that seems to entirely miss the point of anti-authoritarianism as a concept.